Used in Textiles (Mordant), Leather tanning, Adhesives, Catalysts in petroleum industry, Manufacture of incandescent filaments, Corrosion inhibitor, Antiperspirant, Cleaner (De-scalar), Extraction of Uranium, Nitrating agent. Used for Micro-nutrient in Agricultural applications, in Wood preservatives, as Ceramic color, as a Mordant (Textiles), as Aluminum brighteners, in Fungicides and Herbicides, as a Catalyst, in Water treatment, in Paints, Varnishes and Enamels, in Coloring copper black, in Electroplating. Used for Wastewater treatment, Iron Chelates, Analytical Chemistry, Photo-chemicals, Agricultural Micro-nutrient, Sulfur scavenger, Electronics, Etchant, Catalyst production, Chemical Feed-stock, Tanning/Dyeing. Used in Pyrotechnics, in the concentration of Nitric acid, Agricultural Micro-nutrient, in the manufacturing of Catalysts. 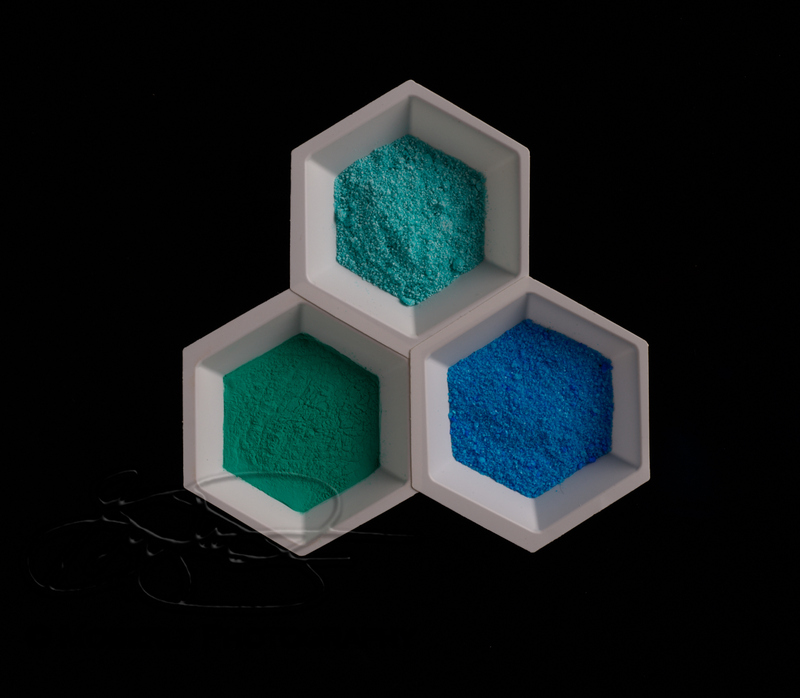 Used in Ceramics/Porcelain colorants, Agricultural Micro-nutrient, Catalyst production, Chemical Feed-stock, Intermediate in the manufacturing of Reagent grade Manganese dioxide. Used for Coagulant in Latex, Agricultural Micro-nutrient, Catalysts for Resin Polymerization, Ceramics, Rust-proofing agent, Mordant dye, Source of Zinc for phosphatizing/metal finishing solutions. Used for Catalysts, Luminous paints and enamels and metal treating. Used as Fertilizer, Flux, Glass manufacture,Concrete admixtures, Pyrotechnics, Reagent, Refrigerant, Dyes, Matches, black powders, manufacture of Sodium salts and nitrates, preservative in cured meats, fish, etc., enamel for pottery. Used for Water purification, manufacturing pigments, rubber pigments, as a catalyst, nuclear waste irradiation. Blu Prep CS-950 is an acidic liquid originally developed to remove chromium plate from copper plated gravure cylinders. It is also useful to remove chromium plating from other items as well. It is economical and allows for parts to be stripped at room temperature. Blu Clean AC-33 is an acidic cleaner which when applied to various metal parts will remove common soil as well as rust This product’s unique formula will provide clean parts and temporary corrosion resistance to a variety of metals including Aluminum and galvanized surfaces. Drawlube 120 is a non-staining water soluble lubricant for stamping carbon steels, aluminum, copper and brass. It has instant solubility in water and will clean in hot water without detergents. This product contains no sulfur or chlorine. It is not soluble in mineral oil or chlorinated solvents.